The German tech start-up EN3 develops innovative systems for the carbon-free generation of electricity from unused residual heat and waste heat. By means of its environment- and resource-friendly energy systems, EN3 makes a valuable contribution to sustainable power generation. Humanity is using its limited natural resources more and more quickly. Each day, the media and countless politicians call for action against the increase in greenhouse gas emissions and demand that a contribution to the reduction of carbon dioxide emissions be made. Simultaneously, the level of consumption in industrialized countries and emerging economies is increasing, and the world's population keeps growing. Thus, it is all the more important to develop new technologies that use the available resources more efficiently. Even today, half of the power generated worldwide is released to the environment as unused residual heat or waste heat via chimneys or exhaust pipes. According to the International Energy Agency, global power consumption could be reduced by 50 % if more efficient technologies were used (World Energy Outlook 2008). Potential power savings amount to more than 1,200 gigawatt (GW). This corresponds to three times the power of all 440 nuclear power plants worldwide (as of 2012). According to the ORC association (www.orc-fachverband.de), the use of industrial waste heat could replace 5 out of 9 active nuclear power plants in Germany alone. By means of our innovative EN3 technology, waste heat may be converted into electricity. This technology is protected by 12 patents, and we have applied for four of these patents around the globe, for instance in the U.S., in China, and in India; some of the patents have already been granted there. EN3 focuses on using the waste heat of internal combustion engines. This includes both combined heat and power plants, i.e., plants for generating electricity, and engines in trucks, cars, and ships. Our company founder and initial investor Dr. Christian Schultz (German business angel of the year 2013) was able to attract several business angels from his network and the VC technology fund of the German state of Mecklenburg-Vorpommern (www.technologiefonds-mv.de) to this innovative project very early. Christian Schultz, his two co-founders Norbert Günther and Andreas Richter, several renowned German business angels, and the M/V technology fund have invested over 1.5 million euros in equity so far. In addition, the German state of Mecklenburg-Vorpommern has provided seven-digit amounts to support this innovation. Using these financial resources, we have successfully implemented our technological innovation and developed a prototype, which is already being used and which has undergone multiple performance tests. The technology is protected by several international patents. Our energy conversion systems are based on a steam power cycle that is used in all modern large-scale power plants nowadays. Our patented steam expander (steam expansion machine) is at the heart of this energy conversion system. Similar to performance-critical chips in modern computers, this is the component necessary to introduce compact energy conversion systems to the market in a simple and inexpensive fashion. To use the waste heat of an engine, one also needs a steam generator, a condenser, and a feed pump. These components have to be adapted to one another to generate the desired additional electricity. Large power plants mostly use turbines. However, using turbines in small systems is unattractive because of the high production costs. Moreover, small turbines are not very energy-efficient. EN3 has solved this problem. By means of our patented steam expander, which is already being used, we achieve high rates of efficiency at low production costs. The EN3 technology enables the carbon-neutral generation of electricity from waste heat. In other words, we convert the waste heat of engines, which is normally released to the environment, into electricity. Our system, whose prototype has already been tested successfully by a northern European technology company, can be used for numerous purposes in the areas of electricity generation from industrial waste heat, biomass combustion, or solar and geothermal power plants around the globe. At the moment, we are focusing on generating electricity from the exhaust gases of internal combustion engines in the stationary (e.g., combined heat and power plants in biogas plants) and mobile (trucks and ships) sector. In 2013 alone, almost 18 million engines were produced within this relevant market (source: EngineLink 2013), which corresponds to approx. 8 % of all internal combustion engines produced worldwide. If only 10 % of this potential were equipped with a system for generating electricity from waste heat, this would correspond to a market volume of over EUR 33.5bn (according to our own calculations). Each of us has an internal combustion engine in his or her car (gasoline or diesel engine), and everyone knows that this is the central component that causes the car to move. Also, it is well-known that both the engine and the exhaust pipe get hot and thus emit large amounts of unused waste heat to the environment. This is precisely the aspect we focus on, for engines will remain a key technology in the future of power generation. Engines are also used in combined heat and power plants, where they are referred to as stationary systems because they remain in the same place. Because of its use in biogas and landfill gas plants, in the supply of people in towns and cities, and in large buildings among other things, decentralized electricity and heat supply plays an increasingly important role. For instance, in the case of an engine with an electric power of 400 kilowatt (kWel) in an average German biogas plant, we can generate an additional power of 40 kilowatt using our technology. This corresponds to 320,000 kilowatt hours (kWh) of carbon-neutral electricity per year that may be generated using the EN3 energy conversion system with a single engine. The electricity generated is sufficient to supply more than 80 households for an entire year. This additional electricity may be used by the operator of the engine or fed back into the power grid. There are additional mobile applications of the EN3 technology in the automotive sector, the commercial vehicle sector (buses and trucks), and the shipping industry. A truck engine, for instance, has a power of 200-300 kilowatt (kW). Even though the internal combustion engine is constantly being improved, as much as approx. 60 % of the energy stored in the fuel are still emitted to the environment unused through the coolant and through waste heat. In commercial vehicles, the additional power generated by the EN3 system may also be used to propel the vehicle. Consequently, up to 10 % of fuel may be saved per vehicle every year (depending on the type and mileage of the vehicle). This, in turn, reduces the vehicle's operating costs and its carbon emissions. If one solely calculates the number of engines for trucks and for combined heat and power plants that are produced each year, the result is currently 16.7 million engines (source: EngineLink 2013). Our patented EN3 expander is the key to market entry in this sector. In order to enter the market, we have developed an expansion machine that enables us to increase power in the entire energy conversion system by 10 %. This is a quantum leap "made in Germany" in the area of power, especially if one considers that engineers in the automotive sector are making huge financial efforts to achieve slight increases the efficiency of engines through changes within the engines themselves. Our target group consists of companies operating combined heat and power generation plants in the power range between 250 kW and 600 kW for the generation of power in the commercial or industrial sector and companies operating such plants in biogas or landfill plants. We address these companies directly or indirectly via sales agents. The latter is true for companies such as engine or combined heat and power plant manufacturers, biogas plant manufacturers, or service companies that will add our product to their product range and market it. Another business segment of EN3 is the retrofitting of existing combined heat and power plants. In such cases, it is very important to know that biogas plant operators are now required by the German law on renewable energy sources (EEG) to find solutions that make their plants significantly more efficient. This is precisely the kind of solution EN3 offers to them. Biogas plants are constantly running for approx. 8000 hours per year and may benefit from considerable subsidies if they use our system to feed power back into the grid (because of the German laws on renewable energy sources and on combined heat and power generation). According to our estimation, approx. 1,200 of the approx. 8,000 biogas plants built in Germany until mid-2014 may be retrofitted, which corresponds to EUR 80m in potential revenue in Germany alone. The very efficient design and easy integration of our system will ensure that EN3 will be able to make long-term service agreements in addition to the integration of the system, which in turn will guarantee a constant and predictable cash flow. Because we intend to cooperate with our northern European technology partner, we will be able to draw on major technology and service companies in the area of stationary internal combustion engines and use their sales systems for rapid market development. Implementation is going to start during our market entry in Germany in 2015 and continue on an international scale from 2017 onward. Depending on the potential of the individual countries, we will use partner companies, sales agents, or our own subsidiaries in order to successfully access foreign markets. Moreover, we may generate significant revenue through the marketing of licenses and patents related to the expander we developed. Based on our research and development activities, we have applied for 12 patents, 4 of which are international patents (PCT applications) for the EU, the U.S., Canada, Russia, China, Korea, India, Japan, Australia, and Brazil. In the case of mobile applications, vehicle manufacturers and suppliers around the globe are developing new technologies to increase the efficiency of internal combustion engines. However, there is no solution to the problem of a missing compact expansion machine (expander) yet. Due to its scalability, robustness, easy operation, and low production costs, our expansion machine is a very attractive potential solution to this problem. Using our product, companies can make a major contribution to the increase in efficiency of mobile internal combustion engines. In addition, EN3 plans to access a highly attractive mass market with this product by cooperating with an automotive company in the area of development. Afterward, we intend to out-license our technology. This cooperation agreement will enable EN3 to generate valuable licensing revenue and to draw on inexpensive, compact, and lightweight components from the automotive supply industry. In so doing, we will reduce the costs for our complete systems, which in turn will improve our competitive position around the globe and enable us to develop new applications with additional potential revenue. At the moment, there is no competitor offering a more sophisticated energy conversion system on the stationary and mobile mass market that includes its own expander and that enables efficient electricity generation from waste heat. Such technologies are still being developed or tested. The concepts available on the market differ from our product primarily in terms of the additionally purchased expander technology and the work equipment used. All expansion machines that are presently known have considerable disadvantages compared to our technology. Indeed, their production is more expensive, and their efficiency in the power range desired by EN3 is lower. This leads to a lower efficiency of the system and less customer benefits. The EN3 expander works without external lubrication, which makes it a low-maintenance device. For more detailed information on the EN3 technology, please refer to the "Technical Details" section. A recent market projection by MarketsandMarkets (www.marketsandmarkets.com) estimates the global market for waste heat usage systems at more than USD 53bn in 2018. Initially, we are going to focus on generating electricity from waste heat in internal combustion engines. In 2013, approx. 237 million internal combustion engines were produced worldwide (source: EngineLink 2013). The areas of power plants (11.5 million units), commercial vehicles (5.2 million units), and shipping (1.2 million units) are very promising. Companies like Siemens or General Electric are focusing on these areas when making investments, so a purchase of the EN3 technology and an exit are possible. Major companies such as Bosch are working on technical solutions that are to be used internationally. Automotive supply companies and companies from the area of energy technology will become more interested in cooperating with us after a successful market entry and thus are another interesting option in terms of an exit. Because of our patented technology, we possess important unique selling points that make EN3 very attractive to such companies. Otto Reinke is in charge of the areas of business development and marketing & sales. He studied economics in Hanover (Germany) and Cardiff (UK) and has gained long experience working in senior positions at international brand manufacturers and companies in the area of renewable energy sources. Dr. Christian Schultz is responsible for the area of investor relations. In addition to his investment in EN3, he has invested in several companies from the areas of clean technology, medical technology, and IT. Because of his very successful activities in the German start-up scene, he was named business angel of the year by the German network of business angels (BAND; www.business-angels.de) in 2013. Norbert Günther is in charge of technology and production. After his studies in mechanical engineering at the University of Rostock, he held several senior positions in the area of product development within the automotive industry. His specialty is technology development for thermal energy systems. Furthermore, we are actively supported by an advisory board consisting of real experts and a team of 14 highly motivated employees in the areas of development and production set-up. The two senior engineers Thoralf Genz (system development and production set-up) and Robert Engel (expander development) are working on our project together with the management and participate in the company's success through an employee participation program. Even at this early stage, involving our employees in the respective purchasing, storage, production, and quality management processes is essential to successful business development. EN3 was founded in 2009. In 2011, we reached our most important technological milestone. The EN3 expander passed its first performance test. We used the next generation of machines for over 100 hours as early as between 2012 and 2013. In so doing, we reached approx. 4.4 kW. In February of 2014, we started using another generation of expanders containing two wheels. This machine exceeds a power of 11 kW and is thus the most important milestone necessary for successful market entry. 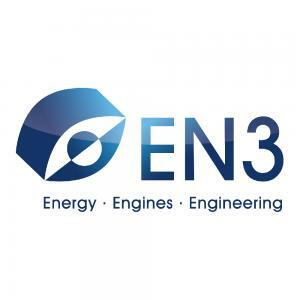 At EN3, we want to produce system solutions that help improve energy efficiency in engines. Consequently, in addition to the continuous improvement of the expander, we started developing an entire system for generating electricity from waste heat in 2013. Within a year, we designed and constructed the first complete waste heat usage system that included a two-wheel machine. Having received the necessary German TÜV certification, the first system was installed in the facilities of a Swedish partner company and underwent several performance tests. We will consider the very positive results of these tests while developing the next generation of the system. For this purpose, a biogas plant near Rostock (Germany) will be equipped with our waste heat usage system toward the end of 2014 or the beginning of 2015. Afterward, we plan to enter the German market for stationary devices by means of a first small series. Trade Sale: The company is acquired by another company from the area of energy technology or energy supply. Licensing Agreements: A major licensing agreement is made in select business areas, e.g., in the mobile area. Investors may receive a dividend in this case. Activities in the remaining business segments, such as the stationary segment, may continue and lead to another exit at a later time. Merger with a complementary industry partner (e.g., system supplier) and subsequent complete exit. Our goal is to achieve a significant return on investment for all investors in the case of a sale of the company. Technologiefonds MV GmbH (VC fund of the German state of Mecklenburg-Vorpommern), Dr. Christian Schultz (Business Angel of the Year 2013 and founder), Dipl.-Ing. Norbert Günther (founder), Dipl.-Kfm. Andreas Richter (founder), Prof. Dr. Gubner (Munich University of Applied Sciences), the small group GmbH, eastwest Venture Capital GmbH, and a group of private investors are the current shareholders of EN3 GmbH. the experienced management and its professional network. This project is a unique opportunity for investors who are ready to support an innovative technology with many potential uses in different markets.